John and I had a little spin to Bristol recently, in fact it was very spur of the moment; we had tickets to go and see some live comedy and decided last minute to shack up for the night in a hotel and make a weekend of it, despite living not so far away. We found ourselves a late booking at Holiday Inn, well located for where we needed to be. We opted out of the hotel breakfast, as being in Bristol we were well placed to find a lovely local spot for breakfast of the veggie / vegan variety. So we went for a wander on the Sunday morning and found Wise Beans in Stokes Croft. A really lovely café, serving organic fair trade food. It is not exclusively veggie, but serves a variety of ethically sourced meat based dishes too. The décor is lovely – neutral tones, vibrant art work, rustic furniture. 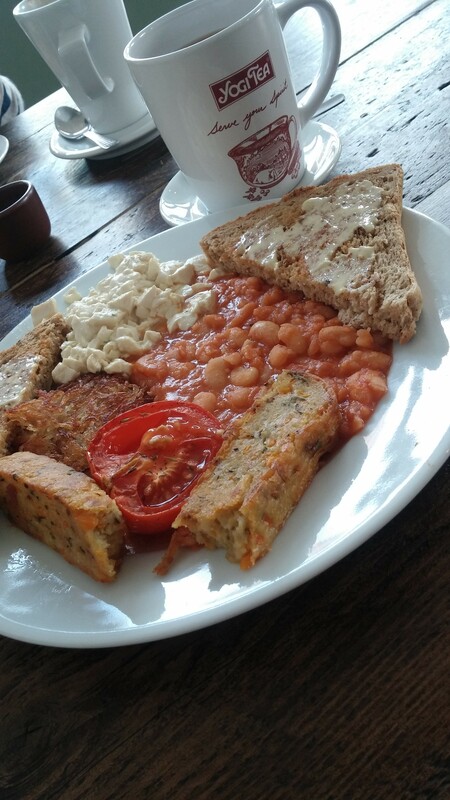 We chose the full vegan breakfast, which comprised scrambled tofu, sausages, potato rosti, organic beans, tomato and spelt toast. Absolutely lovely. And good value at £6.95. Also one of the best soya lattes I’ve ever had.